Up to four atmospheric hazards can be monitored simultaneously by the PhD Lite confined space gas detector, including oxygen, combustible gas and a range of specific toxic gases. 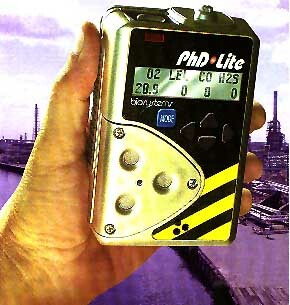 The rugged, compact unit utilizes substance-specific "smart sensors" to provide accurate, dependable, direct readings for the detection of CO, H2S, SO2, and other commonly encountered gases. It can also use the company's dual-channel sensor to measure both CO and H2S when both hazards are simultaneously present. The system incorporates one-button operation, including automatic calibration adjustment. The graphics display and navigation keys are designed to simplify setup choices, and a manually activated backlight allows the display to be read even in dim-light conditions. A bright red LED alarm light is visible from all sides, and a loud audible alarm provides alarm state information. The unit may be configured for use with disposable alkaline batteries or with an internally housed NiMH battery pack. Detectors may also be equipped with an automatic memory download system that uses small memory buttons to store user ID and location information for the environment being monitored. A manual sample-draw kit is included with this system, and optional accessories include a slip-on motorized sample-pump that is powered and electronically monitored by the instrument. A plug-in datalogging board is available.